Gallery Walk, sponsored by the Sun Valley Gallery Association, will take place Friday, Aug. 3, from 5-8 p.m. The exhibition descriptions were provided by the galleries planning to be open at press time. The first nine galleries listed are Gallery Association members. Those marked with a (*) have special events prior and after the walk day, so readers are advised to read this beforehand so they don't miss anything. The Courtyard, 360 East Ave. —Broschofsky Galleries features historic through contemporary paintings and sculpture. Showing this month are paintings by Theodore Villa. Villa's heritage of White Mountain Apache heritage provides inspiration for his watercolor paintings. Imagery is derived from the artifacts he encounters in museum visits as well as private collections and delivered with a clarity of observation. Rendered in vibrant washes, the compositions reverberate with echoes from the past while delivering their message in distinctly dynamic contemporary terms. A tactile quality carries throughout his works, beads render a shiny brilliance, buckskin looks like hand-tanned leather, fur looks like real fur and feathers have such a quality that viewers often make a closer inspection to "see." In opposition of static museum displays, Villa's works have life, motion and, frequently, humor. Fringe from shirts and dresses floats upward and outward, creating joyous movement. A point of balance emerges, that between illusion and allusion. Since the mid 1960s Villa has exhibited works in one-man gallery shows as well as museums and universities in the West, and also throughout the U.S. and Europe. The Galleria, 351 Leadville—Frederic Boloix Fine Arts is celebrating its 10th anniversary with a show of new sculptures by Julian Voss Andreae. The German sculptor based in Portland renders the mysterious world of quantum physics into a three-dimensional reality. His complex laser-cut metal sculptures have received worldwide attention, including features in Science magazine and commissions from Scripps Institute and the University of Pennsylvania. 320 First Avenue N., Sun Valley Road and First Avenue- Friesen Gallery is thrilled to present "Terroir," a major exhibition celebrating the unique character of a specific area: its air, water, land and patterns of growth. The featured artists include Adela Akers, Chester Arnold, Susan R. Ball, Charles Becker, Pegan Brooke, Holly Downing, Robert Gauthier, Frances McCormack, Esther Traugot, Christiane M. Vincent, and Don Williams. Ten percent of exhibition sales will be donated to the Sun Valley Center for the Arts on behalf of co-curators Maureen Lomasney and Andria Friesen. This gift will remain until the exhibition closes Aug. 18. 400 First Ave.—Gail Severn Gallery announces the opening of three new major exhibitions. Hung Liu, often lauded as the most famous American artist of Chinese descent, will be featuring her newest mixed-media work in "Mothers and Daughters." Internationally acclaimed ceramic artists Jun Kaneko and Bean Finneran will be sharing a duel exhibition in contrasts. Kaneko is known for his enormous ceramic "Dangos," which can weigh thousands of pounds. Finneran is known for creating brightly colored large but delicate ceramic sculptures by combining hundreds and often thousands of hand-rolled curves. Boaz Vaadia, whose work can also be seen in museums and collections worldwide, will be exhibiting his stone and bronze sculptures. Vaadia creates sculptures in stacked layers of slate and blue stone that are often larger than life. Also working in bronze, Vadia creates both human and animal figures. Lisa Kokin's exhibition "In Another Vein" features her sculptures of recycled cowboy novels. On Saturday, Aug. 4, at 10 a.m., Gail Severn Gallery will host an artist chat featuring Liu and Finneran. Enjoy coffee and brunch while the artists speak about their creative processes. For additional information, call 726-5079. 320 First Ave.—Now celebrating a 10-year anniversary, Gallery DeNovo features Catherine Chalmers' "We Rule," a multimedia project including video, photography and a number of pencil drawings featuring the stars of the show: leafcutter ants. Chalmers will be present for the opening on Friday, and there will be an artist talk on Saturday, Aug. 4, at 11 a.m. in the gallery. The exhibition will be viewable through Sept. 15. Upstairs Front Gallery: A continuation of "Gravure au Carborundum" with works of James Coignard and additional prints by Christopher Brown, Johnny Freidlander, Cynthia Fusillo, Jose Luis Cuevas and Agusti Puig. Upstairs Back Gallery: Group show of Gallery DeNovo artists. 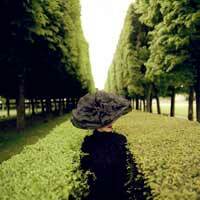 661 Sun Valley Road—"Rodney Smith: A 40-year Retrospective." Smith's photographs express enduring grace and style, often with a touch of whimsy. When asked about the exquisite nature of his work, he says, "I am meticulous in my craft. I expose and process the film by hand slowly and work to produce an exquisite artifact, the print. It is labored to produce a thing of beauty. For me, the print is the creation, the purpose ... the result of my endeavor." Gilman Contemporary will exhibit more than 30 photographs spanning Smith's career. The exhibition opens Friday, Aug. 3, and runs through the Aug. 24. 271 First Ave. N.—Annual plein-air exhibition starts today, Aug. 1, and goes through Friday, Aug. 3. Each summer, Kneeland Gallery brings a group of its well-respected plein-air painters from all over the West to the Wood River Valley to paint the local landscape over a three-day period. The public is invited to watch the artists as they create a painting on the easel from start to finish. These eight artists will be participating: Steven Lee Adams, Fred Choate, John Horejs, Shanna Kunz, Lori McNee, Robert Moore, Jack Braman and Bart Walker. En plein air is a French expression meaning "in the outdoors" and is particularly used to describe the act of painting on location. The artist faces the challenge of changing light throughout the day, and has to work at a fast pace to capture subtle changes on canvas. As this is such a fast-paced technique, each artist brings in one or more wet paintings to the gallery at the end of each day. There they are signed, framed, wired and hung for display during Gallery Walk. The first day of painting will take place from 10 a.m. to 4 p.m. at scenic Trail Creek. People should contact the gallery on the morning of day two for specific artists' locations then. Friday features a ladies brown-bag lunch from noon to 2 p.m. at Kneeland Gallery. Bring lunch and join a Q&A with Lori McNee and Shanna Kunz. 191 Fifth St.—The Center presents "Making Camp," an exhibition that celebrates camping as we know it here in Idaho and also looks at camping in the lives of those who have no other home, either by need or by choice. Featuring work in a variety of media by artists from across the United States and around the world, "Making Camp" including Afruz Amighi, Richard Bosman, Josfina Guilisasti, William D. Lewis, Ranu Mukherjee and Roberto Stephenson, plus an installation in the project room by Brittany Sanders. 360 East Ave.—Join the artists reception of the premier of "Artistic Visions of the West," with new works by internationally renowned artists Dave McGary and Mary Roberson. Dave McGary's historically correct bronzes capture the spirit of the Native American while Mary Roberson's work brings the wildlife of the West with bold spirited oil on canvas. The show will remain up through Aug. 15. 350 Walnut Ave.—Ochi Gallery presents "Muses," an exhibition featuring the paintings of Wildfox Couture's co-founder, Kimberly Gordon, and works by Los Angeles-based painter Elisa Johns. Gordon is best known for creating the designs behind her clothing brand, but her drawings and paintings are portraits in the truest sense. They infuse mood, character and personality into line, paper and paint. Elisa Johns takes landscape and women as her muses. She weaves the two together with paint, evoking a dreamlike and mythical portrait. Ochi Shop will feature the headdresses and bras of young creative Bella Boombox. Join them for a reception during the walk. On Thursday, Aug. 2, at 8 p.m. Bella Boombox and Laddie John Dill will take part in a crazy fun art evening for Expedition Inspiration. See the Around Town pg. C9 for more.